Modern, sleek and space-age design, the AX420 provides high-definition stereo sound with a pulsing 10-watts and superior bass. Futuristic speaker will look great in your home placed near your bedroom, kitchen or living room. • Quickly syncs and automatically pairs to your device within seconds. • Built-in microphone allows you to use the device hands free. • Two built-in speakers offer full high-definition stereo sound and passive subwoofer providing excellent bass. • Line-In AUX to connect to your device directly to speaker (AUX cable included). • USB Charging Port to recharge the speaker for countless hours of playback time. • Playback Time: 8-10 HRS. • Standby Time: 720 HRS. Shop with confidence! Limited 1-year warranty and a 30-day, 100% money back guarantee. Don’t like it? Simply send it back. 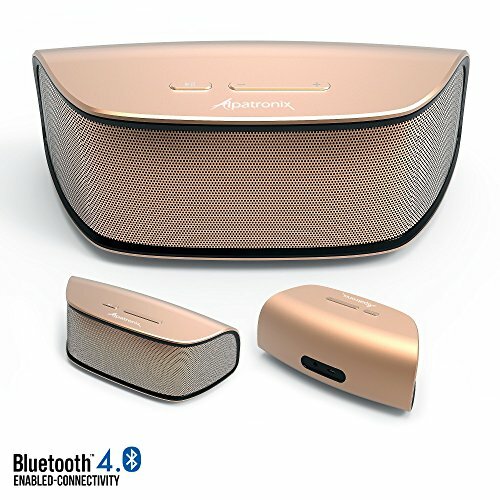 *$5 OFF INTRODUCTORY PRICE (Limited Time Offer)* HIGH DEFINITION SOUND: Latest Bluetooth 4.0 technology provides stutter-free music streaming and seamless high quality audio. Quickly pairs within seconds with a wireless range of up to 30 feet or more. Enjoy high definition acoustic sound with superior bass. COMPACT & LIGHTWEIGHT: Sleek and modern design offers 10 watts of powerful sound and conveniently fits on the palm of your hands. Suitable for both indoor and outdoor areas: bedroom, kitchen, living room, patio, backyard, garage, parties and more! INTUITIVE DESIGN: Easy-to-use physical touch buttons allows you to increase/decrease the volume, switch between tracks, pause/play music or answer/hang up phone calls. Heavy-duty and high quality aluminum alloy housing provides not only an attractive piece to your home, but built to last. RECHARGEABLE BATTERY: Built-in lithium ion battery provides long-lasting, quick charging power of up to 8-10 hours of playback time and 720 hours of standby time on Bluetooth. UNIVERSAL COMPATIBILITY: Compatible with a wide range of electronic media devices such as Apple iPhones, Apple iPads, Apple iPods, iMac, Macbooks, Samsung Galaxy S Series, Galaxy Note Series, Google Nexus, Motorola Droids, HTC One, Nokia Lumia, Tablets, Laptops, Smart TVs & PC Desktop Computers (PC Compatiblity May Vary). 3.5mm aux-in is located in the back of the device to connect directly to any non-Bluetooth device so you can still enjoy your favorite music, tv shows or podcasts.